Life, the final frontier. These are the voyages of Cash4Books. Our mission, to explore strange new DIYs, to seek out new lifehacks, and new life tips. To boldly go where no one has gone before. In previous posts, we’ve laid out some easy ways to make money, but here are our 6 favorite lifehacks to make you extra cash. #1: Fill out online surveys. Do you have great opinions and some extra time? Get a free membership on a site like MySurvey, and get started. You can earn points redeemable on PayPal, Amazon, and more. Your opinion can go a long way and this is an easy way to use them to make some extra money. #2: Sell your class notes. There are several ways to go about this. You can upload your notes online to sites like Notesale or you may want to pursue options through your school. Note-taking work-study jobs are often available, and they pay you for the time you’re already taking notes in class. Now, put those notes to work! #3: Sell photos to stock photo sites. Do you love taking photographs? If so, then this lifehack is for you! Now’s your chance to use your artistic skills and make some cash. Sites like iStock are always on the lookout for more images, and they’ll pay for your contribution. All you need is a camera and an artistic eye! #4: Try being a Mystery Shopper. Certain companies will pay you to test and review services or shops. It’s part-time, and you can work the hours that are best for you. You often not only get paid for your time, but you also score free stuff! Beware of online schemes, though. Be sure to do research before signing up for a program. Here is some more helpful information to start you off as a mystery shopper. If your old phone or iPad is laying around unused, don’t be afraid to sell it for cash and buy the new model. Use that cash to get what you really want. #6: Sell your old textbooks to Cash4Books. With the school year about to start, you probably have some old textbooks from previous years laying around. Just input their ISBN numbers here, we’ll tell you how much they’re worth, and add them to your cart. Ship them to us for free, and we’ll send you cash within 12 days of receiving them. 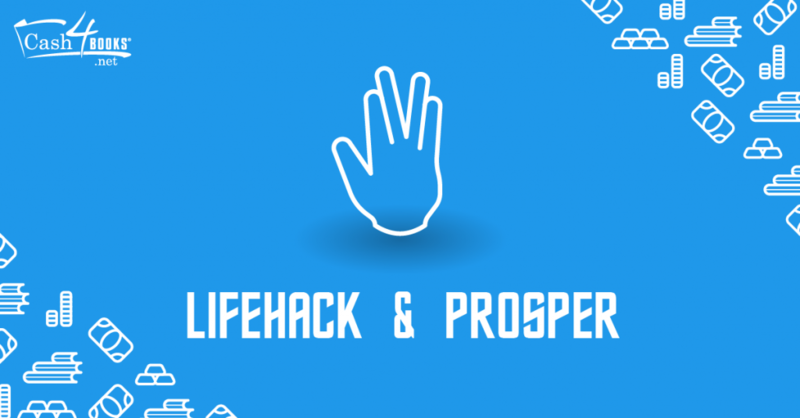 Now that you have 6 great lifehacks to make more cash, what are you going to do with all that extra money? Seriously, we’d love to know. This entry was posted in Making Extra Money and tagged Cash4Books News & Updates, college students, lifehack, make money, thrifty on July 29, 2015 by Jim McKenzie Smith.